Creamy spinach artichoke dip with all the flavor and fun of traditional recipes, but dairy-free and vegan! Simple to make and perfect as is with no cooking required. 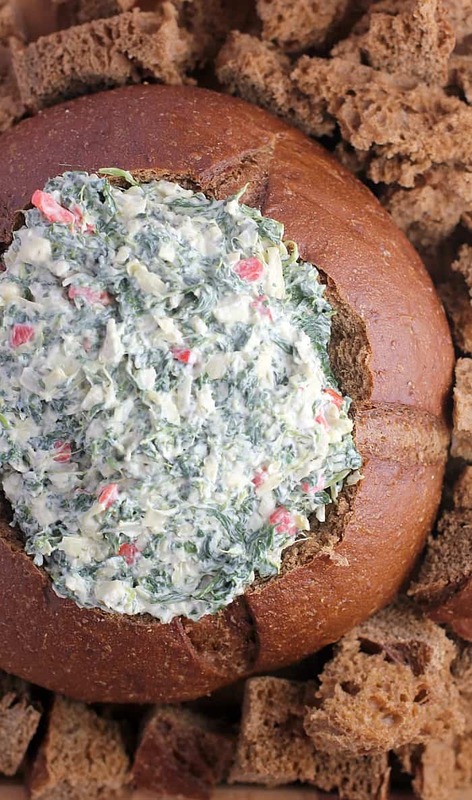 So fill up your bread bowl and make your party perfect with No-Bake Spinach Artichoke Dip. Aaaaannnd, it is time to get our holidays ON! We just passed Thanksgiving, the house is decorated, and now it is time for Christmas. And such. Cool nights, warm blankets, and lots of cookies. …So. Many. Cookies. And of course DIPS. Mmmmm. …No lie. I have not wanted to cook in months. During and after Ironman training, “the busy season” with the kids’ school, activities, and such. I have just been so done. But Thanksgiving morning, Joe installed our new kitchen faucet, and (hear: angels singinggggg) that put me in a mood to cook like I have not been in in ages. And, GET THIS, I created no less than SEVEN completely new recipes that day. And all vegan, mostly (I threw a couple eggs in the stuffing). Seven! My nephew cannot eat dairy and I am vegan-ish, so it was a Very Merry, No-Dairy Thanksgiving. We started with Deviled Eggs, crackers and assorted cheeses (a ridiculous amount cheese, put out by my daughter, the Italian), pickled things like jalapeno slices, olives, and pepperoncini, and a new cashew cheese spread I will share soon. 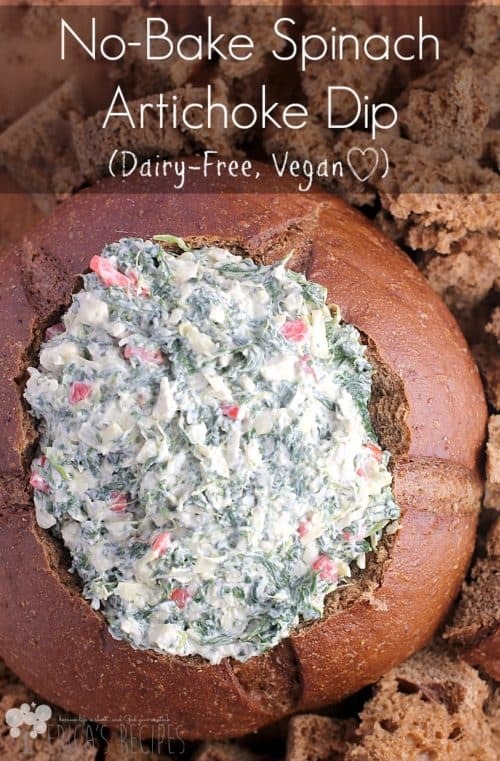 And this new vegan Spinach Artichoke Dip in a pumpernickel bread bowl. Dinner was fried turkey, Dijon Thyme Gravy, creamy vegan smashed potatoes (these were a particularly big hit), cranberry sauce, vegan green bean casserole (complete with fried onions), a vegetarian stuffing with sausage and beer (omg I can’t even…), Hawaiian Sweet Rolls, Walnut Pumpkin Pie, vegan pumpkin pie, and apple pie. Yes, all of it. It was glorious. We even ate in the dining room on the good dishes. That like never happens. So let’s talk dip… Spinach and Artichoke dip. It has been so done, right? We’re so over it?? …Nope nope nope. Because it usually has cheese or sour cream or yogurt – dairy dairy. So I wanted a dairy-free version just as good, if not better, as the rest. Given that dips like this tend to be bland, even with the cheese, I used a tactic here similar to my Artichoke Dip and Skinny Spinach Jalapeno Dip. In this case, jalapenos and pimentos – pimentos for color, jalapenos for flavor. Not enough to make this spicy at all – I repeat, this dip is NOT spicy – but just enough for that wonderful jalapeno flavor to be there and elevate this dip from potentially bland to totally delicious. With no dairy, and we don’t even miss it. A note on the ingredients… This post is not sponsored by any company, so I am only providing brand names of what I use because if you are starting to make the switch to a less-animal-product lifestyle, you may be looking for suggestions. In my opinion, dairy-free “cheeses” are terrible. At least what I have tried. That may change – I just picked up some vegan Parm that I have high hopes for, but generally DF cheeses are concoctions that we don’t need in our life. And they don’t melt right anyway, so why bother. …So, why the vegan cream cheese then Erica??? 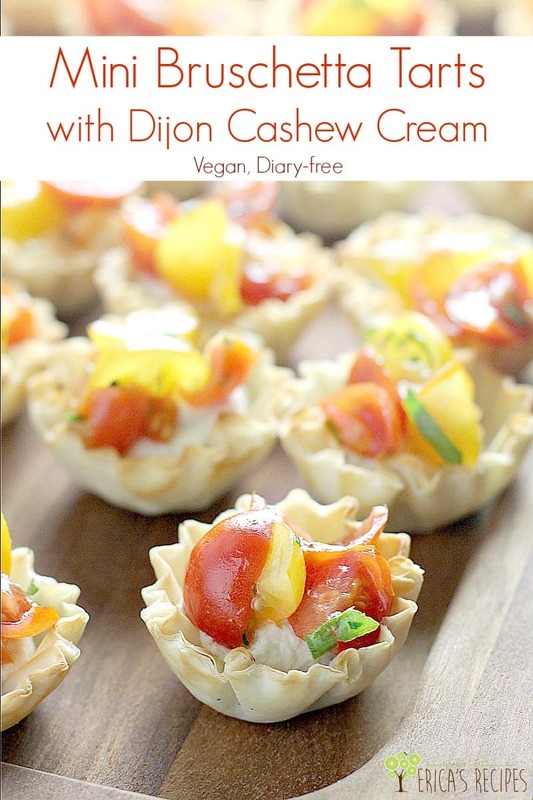 Vegan cream cheese is actually much better than shreds or slices. 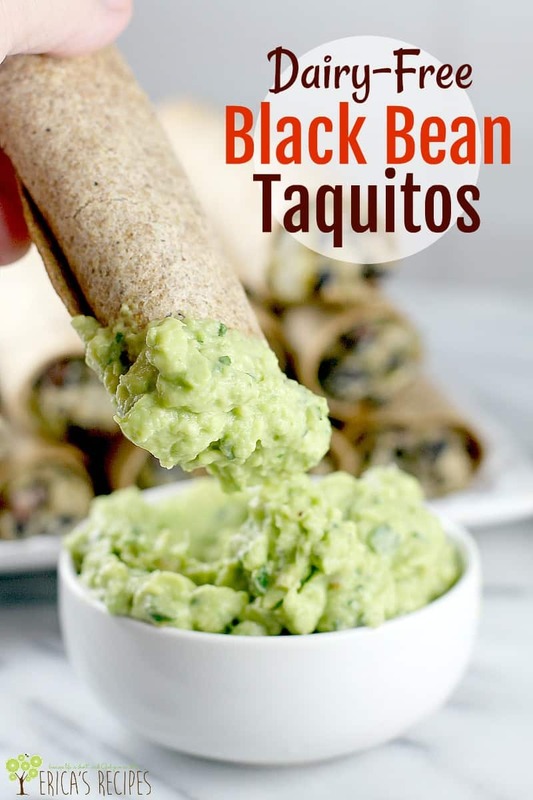 I wouldn’t eat it plain on a cracker, but adding a bit (in this case, a 1/4 cup), adds that creaminess and luxurious texture that we want in a dip like this, with a mild flavor that blends in nicely with everything else. 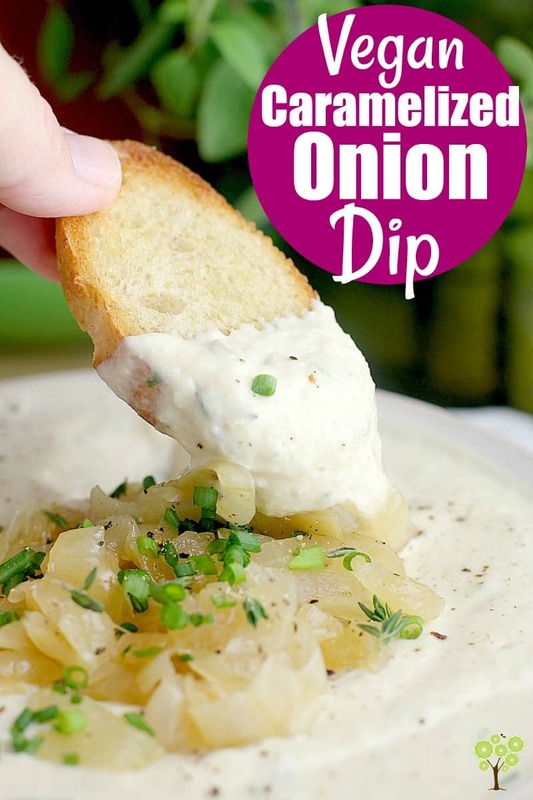 Because we don’t want our dip to be straight-up mayonnaise. But TRUST me, the flavors that shine are the spinach, artichokes, a little onion and jalapeno, hint of Dijon. Truly a new favorite dip for me. So that’s it folks! Just LOOK at this dip and all its holiday glory. I may have made this for Thanksgiving, but I was channeling Christmas when I did. Just an easy vegan Spinach Artichoke Dip dip, full of flavor. A new spin on a classic that I hope you will try and love. Creamy spinach artichoke dip with all the flavor and fun of traditional recipes, but dairy-free and vegan. Combine all the ingredients and put in the fridge to chill an hour or two. Serve in a bread bowl with the bread pieces. Alternatively, serve with crackers. Yields: 8 servings. 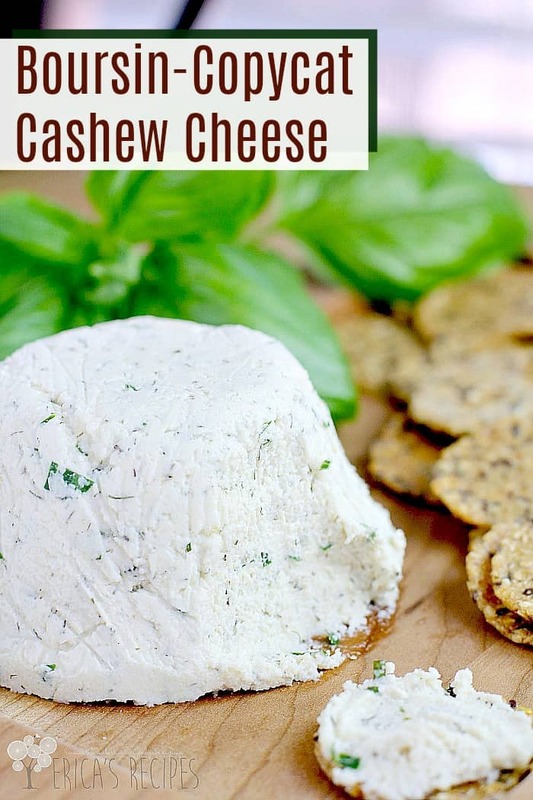 If you want options other than mine for mayo and cream cheese, a light or olive-oil based mayo and soft Neufchatel cheese (is dairy) would work for this recipe. « Finally. I am an Ironman. I used to make a cooked version of the spinach and artichoke dip. This would be a lot easier than having to mix it and bake it. I might take this Christmas Eve to my Sister in Laws. I don’t usually like anything with spinach in it, but I love a good spinach artichoke dip for sure! I bet my mom would really love this! She makes a spinach dip every year for our holiday parties, but I don’t think she ever thought to put artichoke in it. Spinach artichoke dip is one of y absolute favorite appetizers when we dine out. To tell me that I can now have it at home is an absolutely perfect Christmas gift. 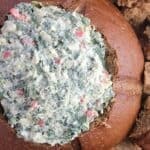 My family loves a good dip and this spinach artichoke dip would be one that I know would be a big hit. This looks easy and delicious. I love making dips for our get togethers. This sounds amazing, I know my family would love to make this. Oh my! The Thanksgiving menu sounds amazing! So many delicious dishes! 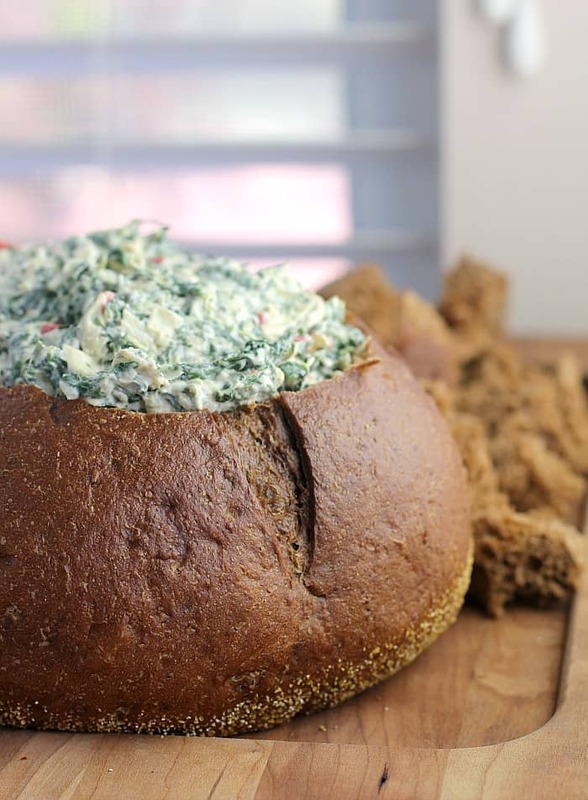 Have to try out your Spinach Artichoke Dip in a pumpernickel bread bowl. Everything is better when it’s served in a bread bowl. That looks amazing. Artichokes are my husband’s favourite so will surely try this sometime. The decoration was really nice! !